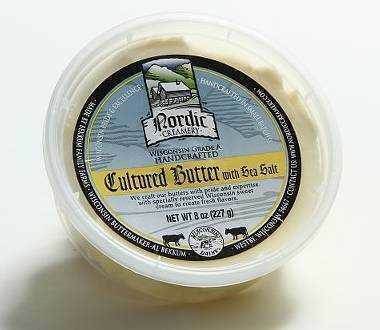 Cultured Butter with Sea Salt is a very rich butter, 85% butter fat, but unlike most butter it is made with live cultures.Gold Medal winner for the unsalted version at the 2017 US Championship Cheese Contest. This multi-day process gives the butter a rich and unique flavor that can actually develop with some aging. This butter is so rich that plain old salt would not do, that’s why we use only sea salt in our cultured butter, so that you get a truly great butter. Cultured butter is a favorite in Europe and can be used in any place where you normally use butter. Cultured Butter with Sea Salt is so rich that many use it as a spread, nothing else needed! I ordered the minimum amount from you quite sometime back, in fact the expiration date is " 10-15 " and we have been out of it for a while now. On pancakes, and in sandwiches, it was more than good enough for all of us here. This is the most AMAZING butter I have ever had! Service Area: Westby, Viroqua, Sparta, Onalaska, Richland Center, Milwaukee, Madison, Appleton, Chippewa Falls, Rhinelander, Eau Claire and surrounding communities.